Hat on Top, Coat Below » Where Did the Summer Go? As I sit here inside typing away on my laptop, outside hints of fall color have started to show up on my mountain. Summer season is over, having wrapped up with the super popular Labor Day weekend beer (and cider and this year komboucha) festival. Now the tourists have gone home, and the lift has stopped spinning, and I feel like I didn’t get enough summer, didn’t pick enough huckleberries, didn’t take enough hikes—probably because I was gone so much these past few months. I wrote about my late-May to mid-June trip the last time I managed to update here; after that I went to Illinois for a couple weeks in July, followed by nearly three weeks on a long road trip with Mr. K’s family in August. In between, I unpacked and caught up on laundry and tried to spend time outdoors and with local friends, and then packed up again. 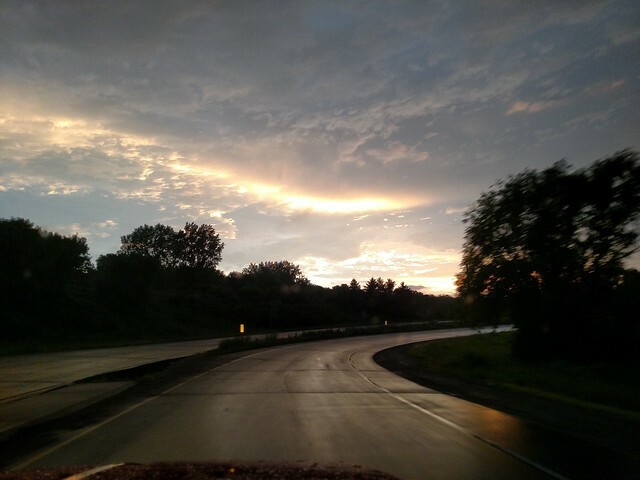 The July road trip was a short one as these things go; we left on the 10th and got home on the 20th, the timing determined by when the family reunion was being held in Wisconsin. I don’t even know how many times we’ve made this drive now, but we’re still seeing new things along the way, and of course the sky and weather provide variety even when we are revisiting places we’ve already been. 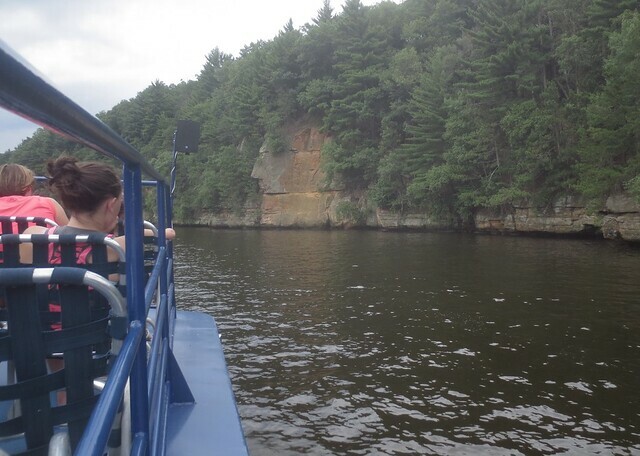 We made it to Wisconsin ahead of the reunion with enough time to do one of the boat tours in the Dells, something I’d done with my mom and brother and grandma when I was a kid but which Mr. K had never experienced. It was hot and muggy when we boarded, then a rainstorm moved in at our last stop on the tour, but I’m glad we did it. After the boat, we splashed our way to a few souvenir stores then had dinner at a place that only serves macaroni and cheese, which I’m fine with. The next morning, we stopped on the way to the reunion to get our contribution to the potluck meal then spent the day catching up with family. 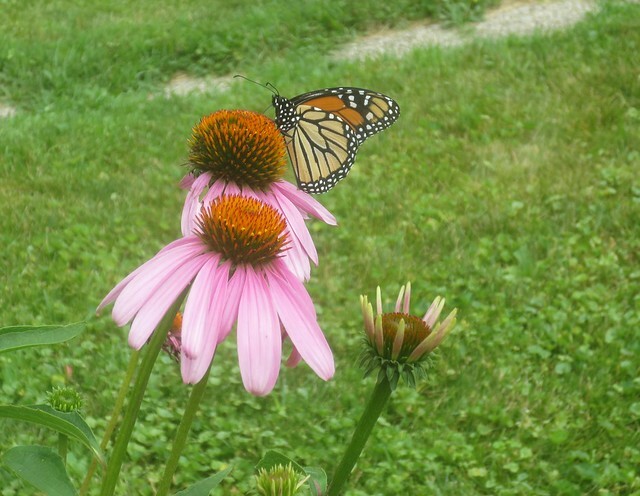 It was too buggy for me (and most everyone else) to spend much time outside but I did manage to catch a shot of a butterfly enjoying the hosts’ front garden during one of the short intervals when I left the comfort of the air conditioning. After the reunion, we headed down to Illinois to spend a couple days with family there. We failed to make a hotel reservation early enough to get a room at our usual place and ended up at a property that was charmingly retro (by which I mean what some people would call out of date and run down). We spent the next day with Mr. K’s mom, sister, and nephew, then the day after that went to clear out the last of the things I’d put in storage when my brother and I sold my mom’s house. We drove by that house and saw all the exterior changes the new owners had made; Mom would have hated them, I bet. 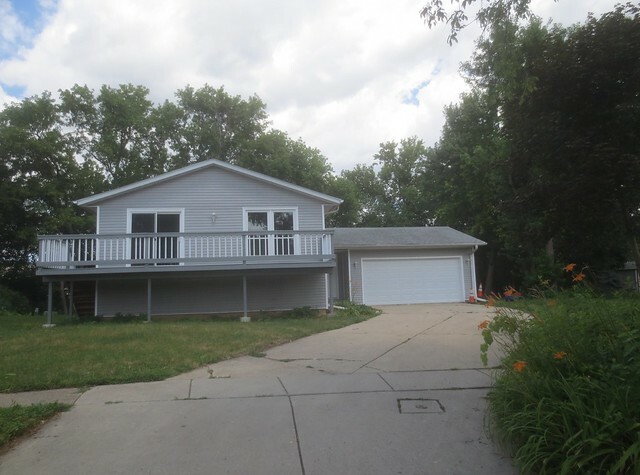 Vinyl siding and minimal landscaping were not parts of her aesthetic, but the house fits into the neighborhood much better now. Our drive home promised to be another version of one we’ve taken many times now, but then somewhere east of Eau Claire, Wisconsin, Mr. K and I got to talking about the list of the best pie in each state that we’d tried a few places off of (the Idaho place is 20 minutes from us, down in town). In trying to find the list we had been referencing in our previous travels, I found another list that said the best pie in Minnesota, the state we’d be in for our next meal, was about three hours out of our way. Somehow we went from “that’s too far to detour” to “hey, if we go there and just head home on the northernmost route, we can hit the best pie in North Dakota and Montana, too”. Which is how we ended up in Two Harbors, Minnesota, having Bumbleberry, Great Lakes Crumb, and Five Layer Chocolate. 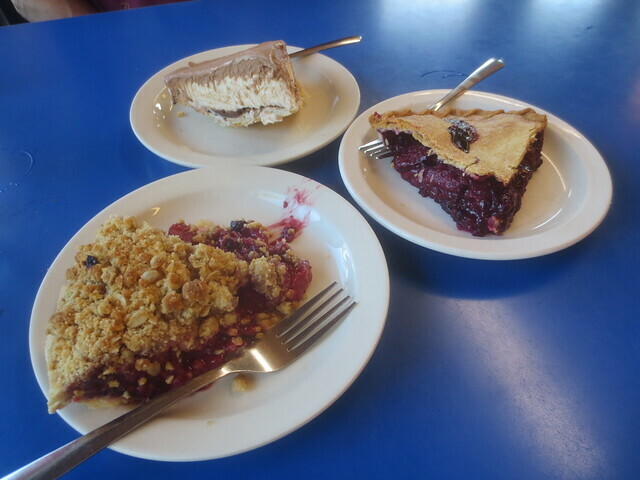 The following day, we pushed to get to the best pie in North Dakota before the shop closed, and the day after that we wrapped up our pie tour in Whitefish, Montana. 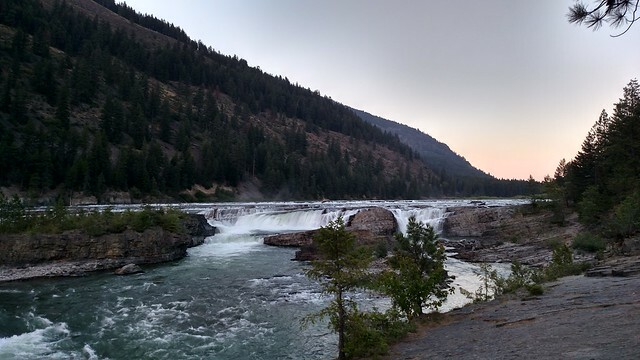 After the pie, we made one more stop on the way home, to see Kootenai Falls, which Mr. K’s sister mentioned she and her husband had visited. Despite it being only about an hour and half from our house, we’d never been. It was pretty, and nice to get out and hike some after spending so much time sitting in the truck on the drive. There are many more photos of this trip in this album on Flickr. I’ll cover our August adventures in another entry, which I hope to get up before we head off on our next set of travels. Comments Off on Where Did the Summer Go?